Amid a heated war of words between Israel and Iran over the Islamic republic's nuclear ambitions, one musician is hoping that an unconventional weapon will help cool the tensions. Iranian-born Israeli Menashe Sasson, 67, broadcasts traditional Persian melodies for an audience in his old home country from a studio in Israel. He hears a note of optimism in the melancholic music and believes it can help Iranians and Israelis overcome the rhetoric of hate. Every Friday morning, Sasson makes his way to Radio RadisIn in Rishon Lezion, a city south of Tel Aviv, and removes an ancient instrument called a santur from a large case. Sasson, dressed formally in a jacket and tie, taps gently on the strings with a pair of slender hammers and produces a delicate sound that is instantly evocative of the Middle East. 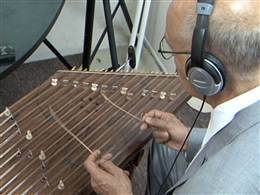 Sasson and his beloved santur moved to Israel 50 years ago but he was born in Isfahan, an Iranian town that is both a center of the Jewish population in Iran and home to one of the country's nuclear research facilities. "I hope that my music can one day bring the hearts of both nations together," he said. Amir Shai, who founded Radio RadisIn four-and-a-half years ago, feels a similar sense of mission. "I had one main goal: to introduce the Israeli culture to the Iranians," Shai said. "For years the Iranian leadership poisoned the Iranian people with lies about Israel. It's time to change this." Manashe Sasson says he hopes his ancient santur music will "bring the hearts of both nations together." Shai sees his radio station as a bridge between two nations in desperate need of better communication, and Sasson and his santur play a big part. While not a household name in Iran, Sasson says he receives hundreds of emails from fans there. "There are a lot of peace-loving Iranians who contact me knowing I'm an Israeli. They're encouraging me and this warms my heart," he said. There is some dispute over the size of the Jewish community in Iran. It has shrunk considerably since the Islamic Revolution but remains the biggest Jewish community outside of Israel in the Middle East. Sasson hopes the situation for Jews in Iran will change.